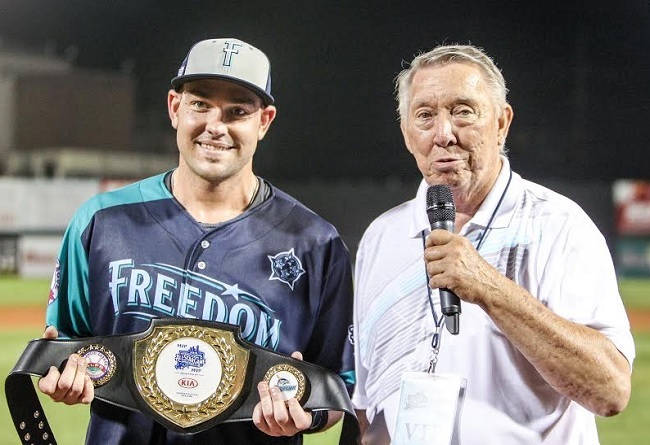 The Atlantic League of Professional Baseball (ALPB) has named its Executive of the Year Award for veteran baseball executive Joe Klein, effective with this year’s recipient, Patrick Day, President and General Manager of the Southern Maryland Blue Crabs. The ALPB Board of Directors unanimously adopted the name change at its recent annual meeting to acknowledge the significant contributions Klein has made to the league since it was founded in 1998. The annual honor will now be recast as the Joe Klein Atlantic League Executive of the Year Award. Klein, a former major league general manager, (Texas Rangers, Cleveland Indians, Detroit Tigers, plus VP Player Personnel, Kansas City Royals), has been active in the Atlantic League since its establishment 18 years ago, and serves as Executive Director of the league, in charge of day-to-day baseball operations. Joe Klein played first base during seven years of minor league baseball in the Washington Senators organization (1962-68), then spent 16 years as a minor league manager and front office executive with the franchise in both Washington and later in Texas when the club was renamed the Texas Rangers. He managed teams in four minor leagues, and in 1976 became assistant farm director of the Rangers, eventually becoming the head of its farm system and director of player procurement and development. He was the Rangers’ General Manager (1982-1984), Assistant General Manager of the world champion Kansas City Royals (1985), General Manager of the Cleveland Indians (1986-89), Vice President of Player Personnel of the Royals (1990-91), and Scouting Director (1992) and General Manager (1993) of the Detroit Tigers. He has served on the blue-ribbon Pace of Play Committee for the Atlantic League, which has trimmed the length of games during the two seasons of implementation by an average of 17 minutes per game. The Atlantic League is the most innovative league in professional baseball, offers the highest level of minor league baseball playing skills, and is a player gateway to Major League Baseball. Its mission is to bring a high level of professional baseball and affordable family entertainment to select communities not presently being served by Major League or Minor League teams. ALPB players are highly experienced professionals, having progressed through professional baseball’s developmental levels (A, AA, AAA). Over 40% of all Atlantic League players have Major League service time. Like MLB, Atlantic League clubs pay their players to win baseball games, not to apprentice as in baseball’s developmental levels. The following teams play in the Atlantic League: Bridgeport Bluefish, Camden Riversharks, Lancaster Barnstormers, Long Island Ducks, Somerset Patriots, Southern Maryland Blue Crabs, Sugar Land Skeeters, and York Revolution. New Britain, CT will join the league in 2016.